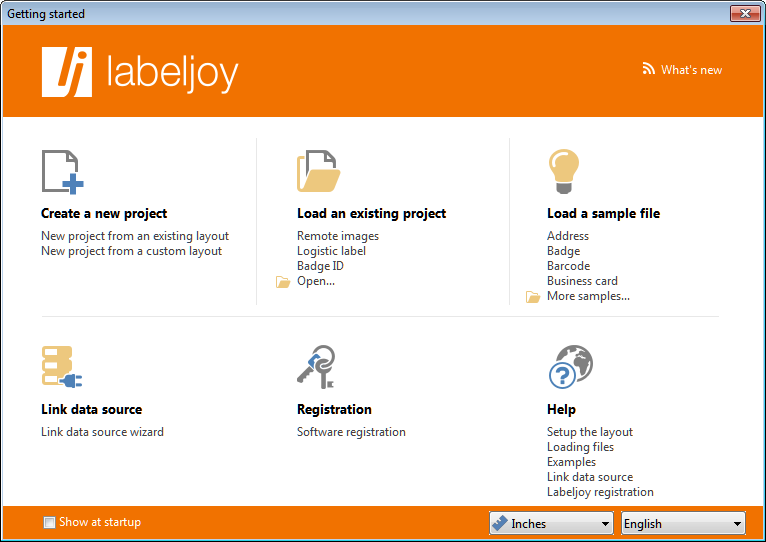 When Labeljoy starts, a welcome screen is shown to offer quick access to the most commonly used features. The first section in the upper left side enables you to create a new project and directly access the layout definition form. The link New project from an existing layout creates a new project and opens the layout form displaying the Layout search tab which enables you to search Labeljoy's layout library for an existing layout file. The link New project from a custom layout creates a new project and opens the layout form displaying the Custom tab which enables you to freely define custom page parameters, quantity of labels per sheet, label spacing, etc. The upper central section enables you to load one of the recently used files. The link Open is also present to manually select a file to be loaded. Labeljoy is distributed with a few illustrative files containing examples of what can be done with the program and that can also be used as source for new projects. Four items are listed and more can be loaded by clicking the More samples link. If you wish to modify, customize and save a sample, it is advisable to save it with a new name right after having loaded it, so that the original sample file won't be overwritten. In the lower left section is found the link to start the link data source wizard. Data connection is available only in the Full version or while in trial mode. This lower central section is displayed only during the trial period, offering quick access to the Registration form. Quick access to the topics of this help file related to each one of the areas found in this welcome screen. Also, in the lower left side of the form the Show on startup check box is found which, when enabled, makes this welcome screen be displayed at the end of starting phase of the program. Un-check this box to avoid that the welcome screen is displayed each time Labeljoy starts. Finally, In the lower right corner are the the unit of measure and the language definition combo boxes, to set up centimeters or inches and the language displayed throughout the whole user interface. By disabling the option Show on start up the welcome screen will no longer be displayed after start up. To manually display it, select the File tab and click the Getting started icon in the Help group.